I am not a big fan of New Year’s resolutions. I think that’s because they set me up for failure. All too often they are big and broad and take an incredible amount of discipline to be successful for a whole year. I suspect it is the same reason I really like Lenten disciplines. They are time-limited to 40 days, which is enough time to develop a new pattern of behavior but not so long that it creates a cycle for defeat. However, I still like the idea of setting a goal or a focus for the New Year — clean slates are opportunities to help us rid ourselves of things that are toxic and embrace life-giving choices. One of my parishioners mentioned this on her Facebook page a few months back, and I was immediately intrigued. So I asked for more information. She told me that the idea is to have one word for the year that you focus on and each day you work on that word. If your word is “Step” and a situation comes up where you can predict how you’d react, you remember your word is “Step” and then you go one step beyond what you normally do. My parishioner told me that she puts a glass jar on her coffee table with her word taped on the outside. Then when in a day she intentionally practices that word, she writes what she did on a paper and puts it in the glass jar. If it’s where you can see the word, you remember to practice it. You can google a list of word-of-the-year ideas, but a here are a few — joy, gift, accept, strength, discipline, believe, love, deliberate, kindness, elevate, gratitude, patience, simplify, kindness, perspective, contribute, shine breathe, brave, relax, focus, just, organize and bloom — the list is endless. My plan is to do it from Epiphany (Jan. 6) to Epiphany. Epiphany is when the Magi arrived in Bethlehem with the gifts of gold, frankincense and myrrh. And the word Epiphany itself means to reveal — so it seems completely appropriate to see this word as a gift that guides me through my journey during the year. It is a deliberate chance to open myself up to new revelations about who I am and how I encounter the world. I see it as an opportunity to truly be guided by the Spirit, and that openness to guidance became completely evident to me even as I chose my word. I prayed about what word to pick and had a word all picked out. But then on New Year’s Eve, I had a vivid dream that made it clear to me that I needed to change my word. Since I wanted to be open to the guiding of the Holy Spirit, when I woke up, I knew in my heart what my word needed to be. My word that will guide me on this year’s j journey around the sun will be “true.” I am going to seek to live an authentic life, be true to myself and my gifts, speak truth and focus on the first part of Phil. 4, which says, “Whatever is true, whatever is honorable, whatever is just, whatever is pure, whatever is pleasing, whatever is commendable, if there is any excellence and anything worthy of praise, think about these things. (Phil. 4:8). When things come up in my life or when conversations occur, I will ask — is this true and is it true to who God has called me to be. Shakespeare said, “To thine ownself be true,” and this is a chance to be true to God and to my values. Even though I said I was planning to start on Epiphany, since I didn’t have a previous word of the year to complete, I had a chance to try it out on my trip home from Christmas vacation and see how this word-of-the-year focus works. Because our plane into Minneapolis from Fargo was late and Ian and I literally had to run through the airport to catch our flight, I didn’t have a chance to grab anything to eat as I had planned. I knew I needed a little something to tide me over, so I ordered a Crunch Box with almonds, Slim Jim and chips with salsa during the flight. The attendant brought it to me but never charged me. I then reminded the flight attendant about it once during the flight, saying I still hadn’t paid, but still no one came and asked for my credit card. It went through my mind that they had two chances to charge me — when they brought it and then later when I asked again about paying — and since they never did, I had done due diligence. Then I thought no, I need to be true to MY values, so on the way off of the plane, I stopped and said I hadn’t paid. The flight attendant said, “Happy New Year. This time it’s a gift. And thanks for being honest.” So I felt good about doing the right thing and I got a free snack box. Win/win! It was a great reminder to stay true! 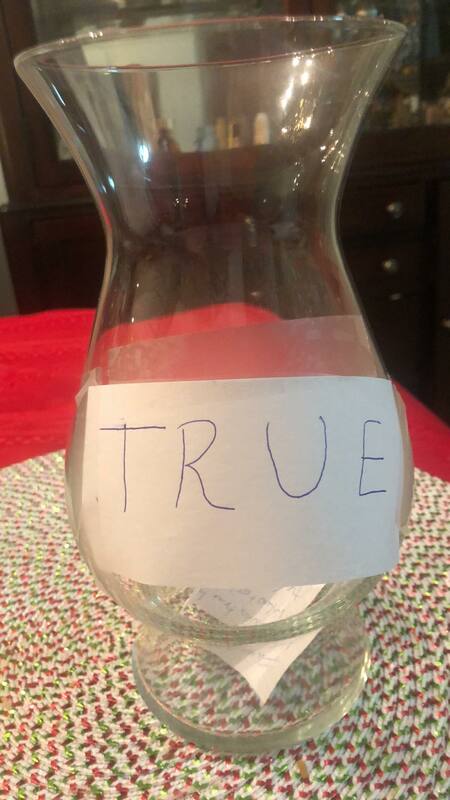 When I got home, I got out a glass jar, taped the word “true” on it, stuck it in the middle of my coffee table and wrote out my first example of staying true. My parishioner shared a photo on Facebook at the end of the year of all the sheets of paper where she wrote how she fulfilled her word and I am excited to do that next year, as well. I plan to make this word of the year a centering place for my prayer life and my spiritual journey — I truly believe God can work through this kind of intentionality and that it will open me up to spiritual growth in new and exciting ways. I have a hunch that this Epiphany journey will be a true revelation. Great idea! I’m borrowing this!